It's always interesting to see the looks on guests' faces when they're confronted with the jellies and jams Chantal serves at breakfast. They come in unusual jars, and they're usually unmarked. When Chantal explains that they're homemade from the fruit that grows just outside the window, another dimension is added to the traveler's stay. Chantal learned jelly and jam making from her German godmother, Tante Henny. A robust hausfrau dedicated to the kitchen, Tante Henny churned out buckets of confiture every spring and summer from her tiny apartment kitchen in Nancy, France. As good as her dinners were--lapin a la moutarde was a favorite--it was breakfast I craved, because breakfast at Tante Henny's was coffee and yesterday's baguette, toasted and slathered with one of her amazing jams: framboise, fraises, and muirs--blackberries. 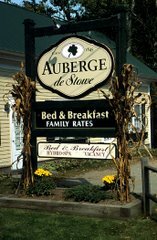 At the Auberge, Chantal has continued that tradition while adapting to the fruits we have available. This year the slope in our backyard is producing a bumper crop of raspberries from three different patches. There's even a small black raspberry bush clinging to the banks of the river. There's also a robust patch of blackberries that should be ready for picking in a couple of weeks. Though we don't have any in our yard, blueberries will be ready very soon, and we'll go down the road to pick them at the Zuber's extensive patch. We do have gooseberries (which have already been baked into a pie, as well as made into jam) and red currants, which don't have much flavor on their own, but are loaded with pectin, the jelling agent needed to set up the jams. But the real star of the show around here is the black currants. When Chantal is boiling the fruit, the smell alone is intoxicating. And the color emitted from the pot can only be described as somewhere between fresh deer liver and Bordeaux wine. It's the kind of color you want for your formal library. The rusulting jam is almost too good to share, and whenever someone bites into a croissant dolloped with black currant jam, their faces widen, and a fifty-minute conversation is launched. This year Chantal did something different with the black currants: she made her own creme de cassis, or black currant liqueur. One of our favorite drinks in the summer is a kir, which is a glass of white wine added to a tablespoon of creme de cassis. In France, the cassis is extraordinary, but in America it's turned into a weak, flavorless brandy. We're always searching for stores that carry the French brands, the best brands coming from Dijon. When Chantal stumbled across a recipe to make your own cassis, she decided to try it. While we haven't tasted it fully yet--we've sneaked a few spoonfuls--we're hopeful that it mimics the real thing. The black currant crop was exceptional this year, so we're optimistic. Until then Chantal will continue making jams and jellies, unitl the last jar of blueberry jam is stocked away, waiting to be trotted out sometime this winter, when it will launch another conversations about the homemade jams of the Auberge. It happened again last weekend: One of our guests took a sip of our coffee and said, "Wow, this coffee is soooooo good!" In the nearly ten years we've been innkeepers, we've heard this about once a week from guests. In the interest of fair play, I think it's time I divulged our secret, mostly because there's really no secret. First of all, it's not the equipment. Each morning I brew coffee in either an automatic drip 12-cup countertop machine (and over the years I've burned through dozens of these things: Brauns, Gevalias, Krupps--I get them at the swap shack for nothing when Stowe's elite are done with them) or a big 30-cup percolator. Either way, the joe that comes out gets the same rave reviews. The only piece of equipment advice I'd give you is this: avoid basket brewers in automatic drip machines. If you have a basket brewer, throw it out and buy a conical brewer. The cone shape intensifies the brewing process, and in an automatic drip maker that never reaches the high temperatures needed to properly brew coffee, this gives the coffee a richer flavor. Second of all, it's not the coffee. With few exceptions we've always used Kirkland Colombian Supremo Bean Roast from Costco. It comes in a handy 3 pound tin, and it features a peel off inner lid, which means I don't have to crank the can opener and deal with the jagged remains of the can's top anymore. This coffee is just plain good and consistent. I'm sure it's not certified organic or anything, but at eight bucks a can it's the right price. For a while during my FedEx tenure I worked at Green Mountain Coffee Roasters in Waterbury. GMCR was very generous with coffee giveaways, and we had the chance to sample and serve all their coffees, but we found that Kirkland still rated higher in the minds of our guests. Thirdly, it's not the guy making the coffee. Most mornings I stagger down with one eye open and whip up a batch of java. As a good friend of mine once said, it's not rocket surgery. To make the best coffee, you need a French press and boiling water. Add six to eight ounces of boiling water to one level teaspoon of coffee and let it steep for sixty seconds, then push the press down. That's the best coffee you'll ever have. The real secret is that it's Vermont. Our water is excellent, and the view is great, and people are generally in a happy mood when they're here. All that contributes to an excellent coffee drinking experience. So if you want to have the best coffee you'll ever have, you need to come up and let me make it for you. Cheers. The Caine Mutiny: Herman Wouk would never be able to spin a tale like this in the instant gratification world of today. It's the story of Willie Keith and all his doubts as he joins the nave in WWII, only to bump into the wing nut Captain Queeg. Wouk leaves doubt lying about in this book the way my kids leave iPods and laptops lying around the house. Everything's messy, nothing's clear. In a move that inspired Jerry Seinfeld, the resolution of the book is that there's no resolution. In Cold Blood: Here's a chipper story guaranteed to lift your spirits. From the first sentence this book is bleak, with short punctuations of happy humanity that begin to resemble roadkill on a west Texas highway. The sheer hideous magnitude of the depravity of the killers should make us all understand the consequences of mental illness. For all the hype around this book, and it's legendary status, I found that Harper Lee--er, I mean Truman Capote--used large parts of depositions and pages-long interviews to fill the text. So I'm not sure that this is the nonfiction novel it claims to be. In Harm's Way: This is the story of the U.S.S. Indianapolis, the ship that delivered the A-bomb, and was later sunk by a Japanese sub. This is the classic navy screw-up story that gets hung on the captain. A heart wrenching read, especially the descriptions (from first hand accounts by the survivors) about what happens to humans when they get blown up, tossed into the sea, and eaten by sharks. The Stones Visit My B&B! No, not the Rolling Stones. The kidney stones. A couple of weeks ago, I woke up and went through my regular routine: make the coffee, let the dog out, and start writing. But within fifteen minutes I was writhing on the floor in pain. The pain came from my lower left back, in the area of my kidney. My mother-in-law whisked me to the ER where kidney stones were diagnosed. The pain was indescribable. When the nurse came to see me, she showed me the little scale of faces used to diagnose pain. You know the one: happy face on one end at number one (no pain), crinkled face on the other end at number ten (take me out back and shoot me pain). I pointed to number ten and cried, "Aarrrghrrrlllmmnsttrrrfff!" In a few minutes I was shot up with several pain killers, and for the next four hours I lay on a gurney, receiving medication updates. Finally, around noon, blasted into bliss by drugs, I was allowed to go home. But the pain persisted for several days, finally abating six days after the onset. The culprits--three kidney stones--were lined up, waiting to be ejected. That was my job now: drink lots of water, pee through a screen, and save the kidney stones for analysis when they showed themselves. This presents a tricky problem for an innkeeper. While I'm fortunate that my wife, Chantal, is the front of the house, I still have plenty of duties behind the scenes. Air conditioners needed to be installed, the fence around the pool needed to be repaired, and I had to prepare for a conference of writers. All of those tasks are difficult to accomplish when you're doped up on oxycodone. Innkeepers don't get to call in sick. Guests can be understanding, but there's a limit to how much they want to hear about your plumbing woes. I've dealt with this illness the way I deal with most unpleasant things: humor. My low profile allows me to make guest appearances out in the breakfast room, tell a few jokes about my pain, and retreat. But the work remains. The writing needs to be done. My two classes at Community College of Vermont didn't go away. So I medicate and wait. I'm mostly pain free, but last Friday I had another attack of moving stones that sent me to the ER when the pain outran the abilities of my medication. The hope is that these things will pass naturally and painfully, but the prospect of a procedure looms. In any case, it will be an interesting summer as I try to balance health with work.